SoarPay is the #1 merchant account for e-Cig, vape, e-juice and businesses in the electronic cigarette industry. SoarPay Is The #1 Choice For eCig & Vape Merchant Services. Most credit card processors do not accept electronic cigarette and vape merchants, for two reasons: First, e-cig related products are age restricted and regulated by the federal government. That means that they require extra underwriting knowledge and procedures by the credit card processor, which many processors are not prepared to offer. Second, eCig and vape products have become a “political” issue, and many sponsor banks and their credit card processors have decided that the political costs to their business outweigh the benefits, and therefore refuse to offer merchant services to legitimate and well run eCig and vape related businesses. By contrast, Soar Payments has proudly accepted eCig and vape related businesses since it’s inception. Our extensive relationships with credit card processors and sponsor banks who are able to underwrite regulated industries, positions us to provide affordable stable merchant accounts to vape and eCig industry businesses; without the terminations or payout freezes that have affected eCig merchants with companies like PayPal, Stripe or Intuit Quickbooks. Shopify, WooCommerce, BigCommerce, Magento, Volusion, ClickFunnels, InfusionSoft, and OntraPort. 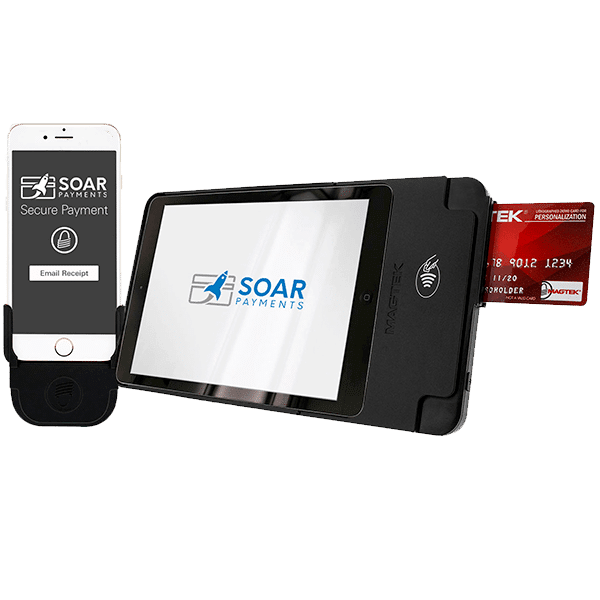 Soar Payment’s vaping & e-cig merchant accounts can be integrated with most other software or CRM platforms which are compatible with the Authorize.net, NMI, or USAePay payment gateways. 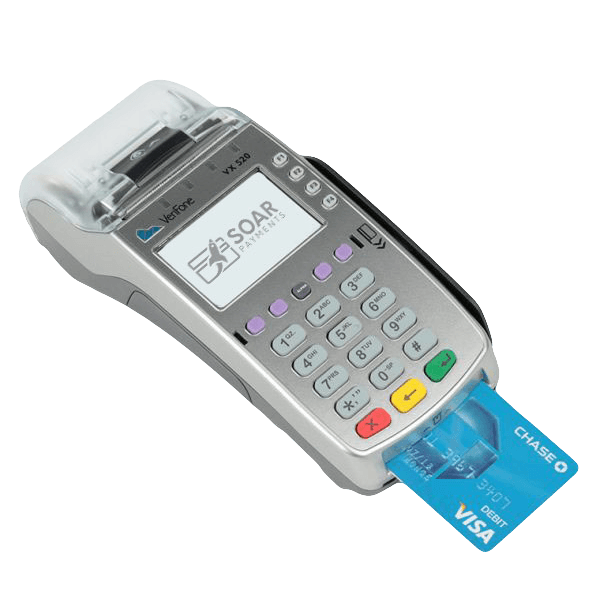 A retail vape merchant account allows your company to accept face-to-face credit and debit transactions via a traditional credit card machine or point of sale system. Best suited for a traditional storefront retail setting with a reliable wired internet connection, examples include retail vape shops, head shops, glass retailers, and smoking lounges. Retail credit card processing has the lowest cost, because of its lower risk of fraud or chargebacks. A mobile vape or eCig merchant account enables your business to accept face-to-face payments via an attachment that plus into your mobile phone or iPad. Ideal for eCig or vape merchants who sell outside a traditional storefront, such as eCig and Juice retailers that sell at conventions or outdoor events, it does not require a wired internet connection. Mobile eCig merchant accounts are typically priced similarly to retail as the rates of fraud and chargebacks are relatively low. Commonly called a payment gateway merchant account, a virtual terminal allows you to accept payments over the phone, via mail order, or typed into a special website via your computer (without any outside equipment). eCig payment gateway accounts are best suited for businesses who primarily want to accept orders over the phone. 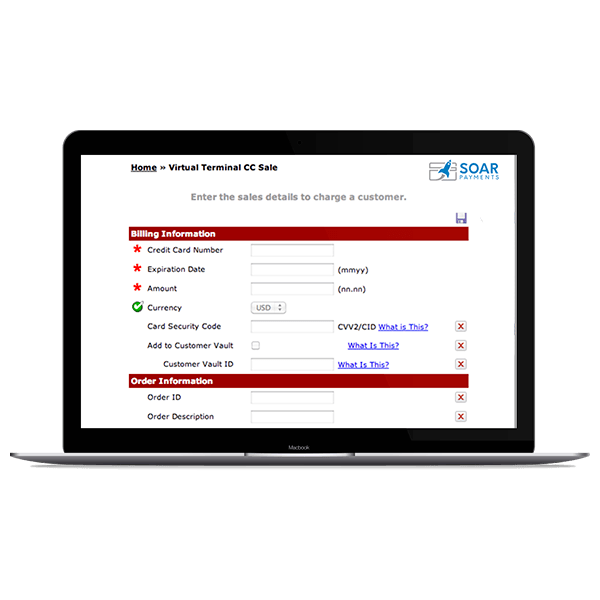 Due to increased risk of fraud and chargebacks, Soar Pay offers fraud protection technology to protect the business with these accounts. Want to sell eJuice, eCigs, or other vape related products online? You’ll need an eCommerce merchant account with an integrated payment gateway. Our Vape and eCig eCommerce merchant account integrate with most major shopping cart and payment gateway platforms, making setup on your website simple. Due to the increased risk of fraud and chargebacks on eCommerce vape sales, Soar Payments offers integrated fraud protection technology. What types of eCig industry businesses do you accept? 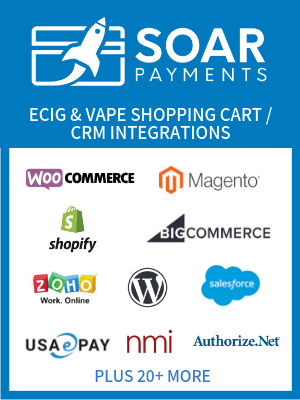 Soar Payments accepts a wide range of retail, eCommerce and mobile-based businesses related to eCigarettes and vaping. These include eJuice, e-Cig, glass, head shop, smoke shop, vaporizers, vapor, vape pods, cigalikes, accessories, smoking lounges, and related goods and services. 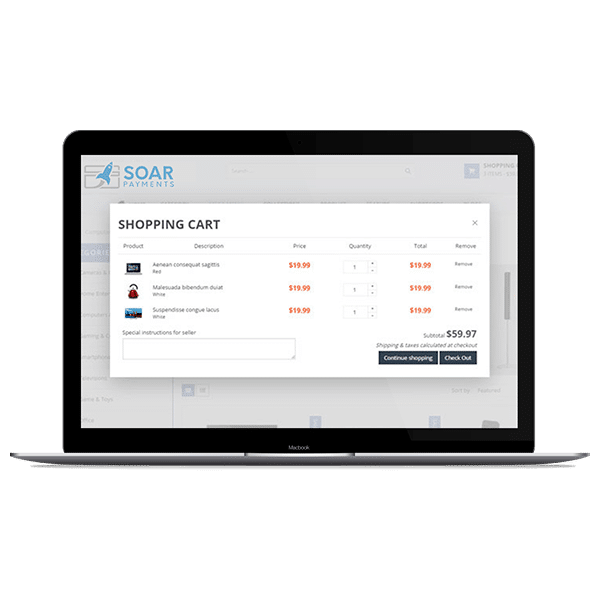 Is Soar Payments compatible with my existing ecommerce or software platform? Ecig and vape businesses typically have a preferred ecommerce, CRM or marketing automation software platform they use. 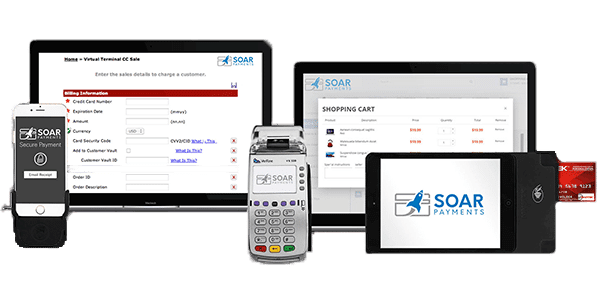 Because Soar Payments works with most major payment gateways (including Authorize.net, USAePay and NMI), our merchant accounts integrate with most popular software suites used by businesses in the vaping & e-cig industry including: Shopify, WooCommerce, BigCommerce, Magento, Volusion, and similar ecommerce platforms, as well as marketing automation platforms like ClickFunnels, InfusionSoft, and OntraPort. 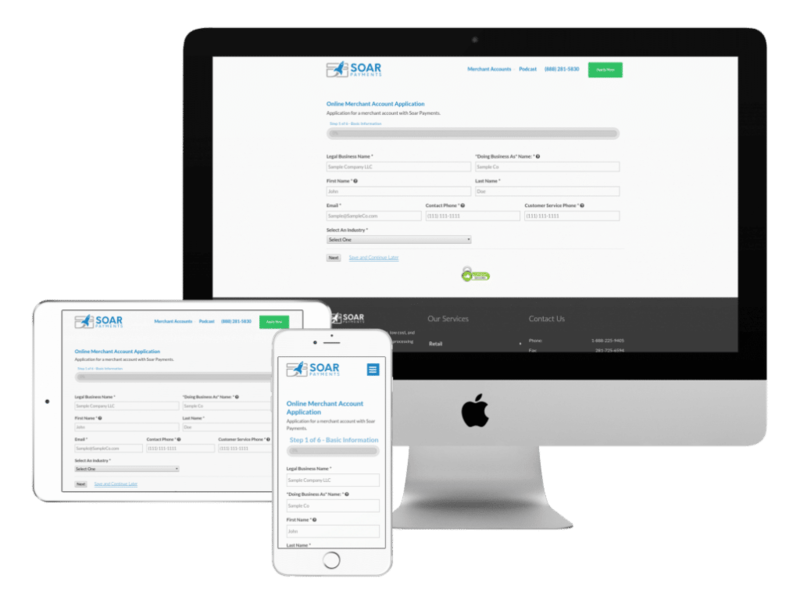 What criteria does my vape or egic business need to meet, to be approved for a merchant account by Soar Payments? To be approved, vape and ecig businesses must meet the the following criteria: must only sell vaporizers that work with e-juices; must not sell vapes that can be used with herbs or flowered plants; must not display any Marijuana/Cannabis imagery of any kind on products or web site.